This spacious and attractive 3 Bedroom/Loft + 2.5 bath luxury townhouse in is nestled across from the Snowcreek meadow with beautiful aspen trees on one of Mammoth’s most premier properties. Located close to the Snowcreek Golf Course, Snowcreek Athletic Club and the Red Line winter shuttle. This Townhome sleeps up to 8 people with space for individuals to maintain privacy. This beautifully furnished condo is laid out is divided into multiple spaces so several groups can congregate without disturbing others. WIFI High Speed Internet Access throughout the Condo. In the living room, you’ll find a wood burning fireplace and doors that lead to an outdoor deck. 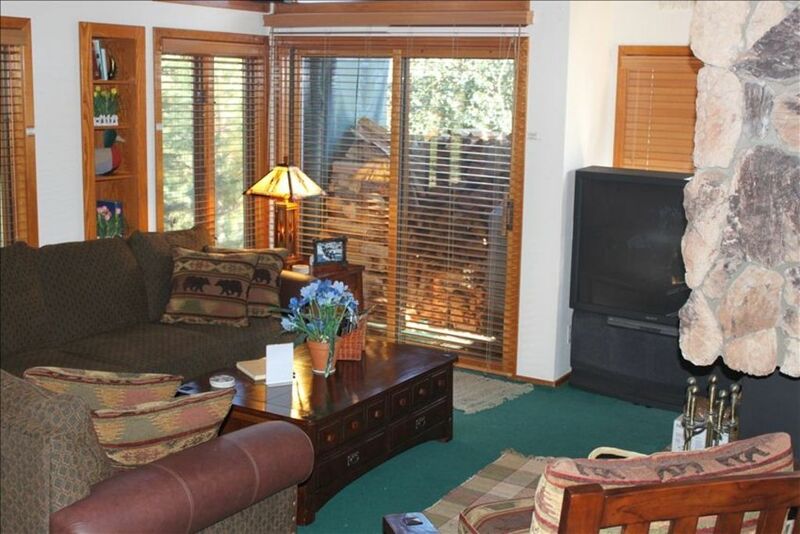 Enjoy views of the Sherwins from the deck and windows. This is a perfect place to cozy up with a book and watch the snow flurries or the family to enjoy a video. The Kitchen is fully equipped with electric range, microwave oven, dishwasher, refrigerator and garbage disposal. The Dining Room seats 6 with and additional 2 at the eating bar. •	Spacious Laundry Room with washer and dryer and abundant storage. •	Two twin beds. A perfect place for the “kids” retreat! Beautifully landscaped Snowcreek offers luxurious grassy knolls, spas, saunas, and a quiet neighborhood. Enjoy a hike in the meadow or a cross country ski trek while taking in nature's majesty. There's no limit to the exhilarating experiences and adventures you can have in Mammoth – fish in our many lakes and streams, tee it up at California's highest golf courses, hike in the backcountry and celebrate in the mountains. Winters in Mammoth Lakes are famous for huge snow packs. Recently over 600 inches have fallen in one season. Mammoth offers more days on the hill than any resort in California. 350 skiable acres. 3,100 ft. vertical drop. 150 trails. 29 lifts. In addition to the exceptional skiing and snowboarding you will find miles of trails for snowmobiling, snowshoeing and cross-country skiing, all with magnificent views of the surrounding Sierra Nevada Mountains! Guest's will be required to complete, sign and return the rental agreement. Thank you. We are Mammoth homeowners who have enjoyed the eastern Sierra for 3 generations. Snowcreek is the most beautifully landscaped complex in Mammoth and also not dense. Beautiful views of the Sherwins, meadow and Mammoth Rock. Close to all conveniences and perhaps the best complex for all seasons. Beautiful view of the Sherwins and Mammoth Rock! Large screen TV in Living Room, TVs in each bedroom. Cable Televison in every room. This is a great condo! Good location. Clean. Kitchen very well-stocked with everything you'll need if you'll be cooking. Even some spices! We were pleasantly surprised to find a highchair in the dining room, as we had a little one with us. Beds were very comfortable! Heating is good, once you get the heaters set right. It is four-stories so you have to be o.k. with steps. Very comfortable condo. I recommend this condo and we hope to stay there again in the future. Fabulous rental with lots of space. We had a great stay at this location. The condo is very spacious and there is plenty of room in all the different areas (bedrooms, loft, kitchen, dining room, and living room). We had a group of 8 people and it never felt cramped at all. There are plenty of pots/pans/kitchen utensils to cook with, as well as a nice big laundry room. The condo owner was very responsive before our arrival, provided lots of details about the condo, and area. He also checked in with us to make sure we were comfortable and if we needed anything after we checked in. Parking was super easy as you can park in front of the condo. Really great place! Please note there is a $250 cancellation fee for cancellations greater than 45 days prior to the reservation date. Please review the cancellation policy listed in the rental agreement.